Join us for our second annual kirtan retreat at Sivananda Bahamas. In this time of turmoil, one of the most important and profound ways to connect with your divine nature is through the practice of compassion. Compassion is what connects us all and heals us. Compassion connects us with Truth and can heal all suffering. Phakyab Rinpoche, a Buddhist lama who healed his own near-fatal gangrene and spinal tuberculosis through meditation and mantra, believes that the inner state of compassion is the ultimate healing state. In other words, through compassion, miracles can occur. It is also said that in this degenerate age, one of the swiftest and surest ways to connect with your compassionate heart is through singing and chanting. Chanting (in the context of kirtan or mantra recitation) combines two powerful tools: mantra and sound (via the vehicle of your voice). Many of us have forgotten that our voices are healing instruments. Each of us has a unique voice calibrated to heal, balance, and tone our own physical, mental, and emotional systems. So in that sense, there is no such thing as a “perfect” voice. Your voice is meant for you. Your voice is meant to heal you. And others. And the world really needs to hear your healing voice right now. So on one level, this retreat is perfect for those who wish to connect with and/or rediscover their own true voices. In the afternoon workshops we will learn “how to sing”–not so much from a technical aspect (although, of course, we will explore technique); but more from a spiritual, shamanic and yogic approach. Using our voices as a vehicle for meditation, and learning how to tone specific seed syllables and bija mantras, we will experience what is like to become sound, and use those sounds to purify our systems. Also in the afternoon workshops we will explore a number of compassion practices from various traditions. Using the teachings of Swami Sivandana, Pema Chodron, St. Francis, Rumi, Shantideva and others, we will practice some simple yet profound methods which can awaken your compassionate heart and enable you to be a source of comfort, guidance, and strength for all beings. We must take care of each other, and of all beings on Mother Earth. Compassion is the way. In the evenings, we will come together for kirtan, a powerful and profound experience in which we joyfully sing Divine Names and invite that divinity to pour into us, and move through us and back out into the world. 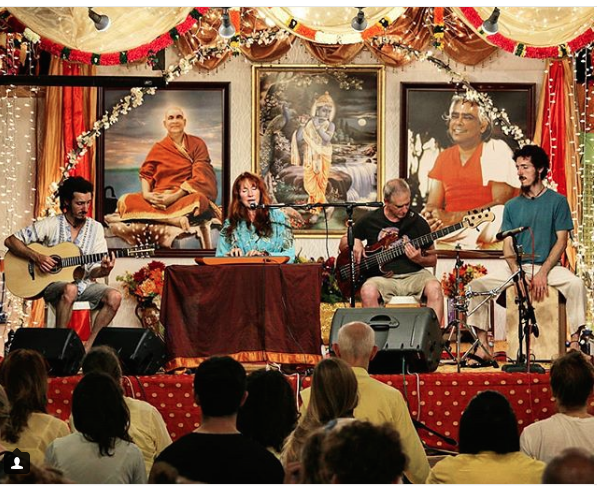 Kirtan is an incredibly heart-opening experience–an experience which will alter your life forever. This is because once you experience Union with yourself, with others, with the Divine, you will continue to seek ways to stay unified. And the world will continue to become a better place because of it. Because of YOU. “A meditation technique used a great deal in Tibetan Buddhism is uniting the mind with the sound of a mantra. The definition of mantra is “that which protects the mind.” That which protects the mind from negativity, or which protects you from your own mind, is mantra. Lee will be joined by the musicians Danny Solomon, Owen Landis and Ezra Landis. We hope you can join in song, prayer, and divinity. Immerse yourself in kirtan and experience the sublime powers of mantras that can remove obstacles, purify your kleshas (mental afflictions) and connect with your authentic self. No singing experience is required — just the desire to heal yourself and others through song. Come and discover the healing power and beauty of you. Offered as 2 satsangs and 2 afternoon workshops.